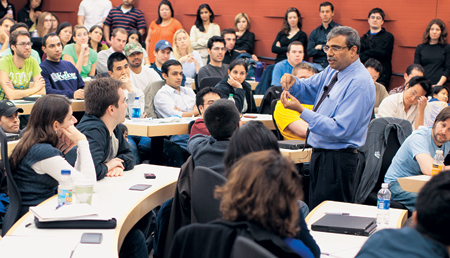 Success comes to those who sacrifice, not just optimize," Dipak C. Jain likes to remind Kellogg students. The words — simple, powerful — transcend an easy attempt to inspire. They describe Jain's philosophy, one that has propelled him from humble roots in Assam, India, to the dean's office at one of the world's premier leadership institutions. Drawing from personal experience, Jain, 52, emphasizes that traveling the path to a goal is as important as the goal itself. "The journey's outcome is the sight; the process to reach that outcome is the insight," he often says. Such perspectives reveal much about the outgoing Kellogg School dean and what he thinks it takes to turn potential talent into real results. Those prepared to work hard, focus on the intrinsic value of the task at hand and contribute to a cause greater than themselves will be rewarded. Those just looking to cut corners, however, may find themselves with little to build a career on. So says the mathematician-turned-marketing scholar, who arrived at Kellogg as a junior professor in 1987 after earning a doctorate from the University of Texas in Dallas that year. He hit the ground running, working diligently to become first a better teacher and then an administrative leader. Given the chance in 1996 to serve as Donald P. Jacobs' associate dean, Jain redoubled his dedication to Kellogg, taking on any assignment that came his way and supporting the effort to advance the school's global Executive MBA programs in Asia, Europe and the Middle East. "Dipak was always working," Jacobs has said in explaining why he selected his younger colleague to join him in the dean's office. "Whenever I needed something done, I could turn to him and he would make it happen." Since becoming dean in 2001, Jain has continued working tirelessly to lead the academic and global brand-building efforts for Kellogg while developing a culture of innovation and inclusivity at the school. After a total of 13 years in the dean's office, Jain, the Sandy and Morton Goldman Professor of Entrepreneurial Studies, is stepping down from that role effective Sept. 1, 2009, to return full time to the Marketing Department faculty. Sunil Chopra, the senior associate dean for curriculum and teaching and the IBM Distinguished Professor of Operations Management and Information Systems, will serve as interim dean as the university begins a search for Jain's successor. Jain's roll-up-your-sleeves approach, along with his genial manner and what he calls a "distributed leadership model" that assigns defined responsibilities to key people, has served him well throughout a tenure that boasts many achievements — including increased academic offerings, expanded alumni outreach and a stronger global Kellogg brand. "These were initiatives I spelled out in the early days of my deanship," he says. "It has been a great honor to work with my colleagues to achieve these goals and put in place the processes to move Kellogg from being individual-driven to being institution-driven." In fact, he says, working with Kellogg faculty, staff, students and alumni "has made my job a joy." Collaboration has been one of the distinctive features of Jain's deanship and is a quality he says is rooted in the school's history of team-oriented leadership, an aspect he has worked to deepen during his tenure. At the same time, Jain has emphasized the importance of innovation and analysis. This blend of intellectual rigor and business relevance, along with a focus on developing superior people skills — the "soft skills that make hard impressions," according to Jain — have distinguished the school over the past eight years. Challenges along the way have tested — and ultimately affirmed — Jain's leadership. One of the earliest took shape the morning of Sept. 11, 2001, as Jain prepared to welcome his first incoming class of Kellogg students as dean. In the aftermath of that day's terrorist attacks — which claimed the lives of three Kellogg alumni — Jain and his team offered calm and compassionate leadership, helping students contact family and friends and providing support to those affected by the attacks. During the subsequent economic downturn, Jain led an all-out effort to secure full-time and internship positions for students, traveling around the world to network with recruiters to uncover job leads. Collaborative by nature, Jain turned to Kellogg alumni for help — and they responded in astonishing numbers. Some saw this outreach as a public relations risk, recalls David Besanko, who was senior associate dean for curriculum and teaching from 2001 to 2003. In retrospect, however, "it was a brilliant vision that Dipak had to do all this," says Besanko, today senior associate dean for strategy and planning. Jain exhibited a similar degree of collaboration and concern in 2003, when the burgeoning SARS health crisis threatened to derail the Global Initiatives in Management program, an experiential learning course that includes two weeks of in-country fieldwork in nations around the world. About 220 students had just departed the country, some traveling to areas hard-hit by the epidemic. Thanks to an expertly coordinated logistical effort by Kellogg faculty and staff who were monitoring reports from the U.S. State Department, Centers for Disease Control and the World Health Organization, all of the trips proceeded smoothly. "We were like an air-traffic control room, making sure that all the flights landed safely, and rerouting students when conditions on the ground appeared too dangerous," Jain remembers. More recently, the current economic crisis has prompted Jain and his senior staff to expand support for students and alumni, broadening Career Management Center programming to offer additional workshops, virtual job-search groups and greater alumni outreach. "Uncertainty is inevitable; worrying is optional," Jain says in describing his crisis leadership style. "It is how you respond to challenge that matters." This is why he encourages students to "dig deeper" to gain profound insights into today's business challenges as they work to design strategies and solutions. "Learn not only what happened, but also how and why it happened, drawing on hard data to cultivate understanding and drive decision-making," he says. In this way, he adds, students can "anticipate" change in a global market where clear prediction is often impossible. In addition, Jain says leaders must keep their feet on the ground — and their egos in check, a principle he recalls learning early in his career as a young university instructor in India. "In 1979 I asked an older professor for his best advice," Jain says. "He told me, 'Dipak, always remember: When your shadow becomes longer than your height, the sun is about to set.' By this he was offering a warning about what can happen if we are driven by ego — the shadow — rather than taking care to maintain a sense of humility and a spirit of service." To this day, Jain says he often considers this advice and has tried to cultivate it throughout his career. As he exits the dean's office to return to teaching and research, Jain can reflect on achievements that include designing the school's overarching framework. The Kellogg School's "Four Pillars" — intellectual depth, global perspectives, experiential learning and social responsibility — form the basis for a holistic approach to leadership education. Most fundamentally, Jain and his administration have strengthened the school academically across all areas, bolstering teaching and research and recruiting top talent to Kellogg. Jain implemented a comprehensive curriculum review even as he and his colleagues painstakingly researched insights from recruiters to ensure that Kellogg graduates possessed the up-to-the-minute skills they needed to thrive in the marketplace. One focus has been the school's leadership curriculum, but in every department — from finance to marketing, as well as in programs like entrepreneurship and family business — Kellogg has consolidated and extended its thought leadership under Jain. Those efforts have rippled beyond Kellogg into the greater Northwestern community. In collaboration with colleges across the university, Jain has paved the way for initiatives such as the Undergraduate Certificate Program, a quant-heavy curriculum designed to educate an elite, younger segment of scholars. Jain remains a strong advocate for such efforts. "Business schools should become intellectual hubs, where colleagues from many fields collaborate in meaningful interdisciplinary work," Jain says. One such example is the school's Global Health Initiative (GHI), launched in 2005 in conjunction with Northwestern's McCormick School of Engineering. Today GHI continues to find ways to bring affordable AIDS medication and diagnostic devices to African nations and other impoverished countries. Jain has also spearheaded efforts to revitalize connections between the school and its graduates by increasing staff, resources and programming for alumni engagement. Results are reflected in record Reunion participation as well as the creation of a powerful online networking portal and a dynamic global community. Similarly, Jain has championed the expansion of the school's global footprint, launching an Executive MBA program (EMBA) in Miami in 2006. The program's immediate success has strengthened the Kellogg brand throughout Latin America and the southeastern United States, complementing the school's existing portfolio of international EMBA offerings. Similarly, he oversaw the move to extend the EMBA "Live-In" experience from one to two weeks, allowing students from Kellogg partner programs in Europe, Asia, the Middle East and North America to enjoy an intensive residential program in Evanston. "In doing this, we enhanced the feeling of camaraderie the students felt, and as a result we also enhanced the global Kellogg community," Jain says. "When students returned home, they continued to interact with their Kellogg peers across all our EMBA programs, since these were the people they met during 'Live-In' here." Most gratifying for Jain is the collective impact of the school's global network. He sees Kellogg as a catalyst to advance individual careers, but, more than that, he says the school produces a unique kind of leader with a drive to create positive change. "Our job as educators is to provide the tools that enable people to succeed," Jain says. "But I personally believe we must also offer a vision for how to turn that success into significance, into broader, more meaningful social benefits that improve the world." Besanko, who has worked closely with Jain over the years, was on the search committee that recommended him to the university as Jacobs' successor. He says that his colleague was "exactly the leader the Kellogg School needed" for this transition. "Apart from Don Jacobs," says Besanko, "Dipak understood, more than anyone else connected with the school, the landscape of management education and the challenges and opportunities facing Kellogg within that landscape. We needed a leader who would bring a new generation of faculty into school leadership, something he accomplished by distributing leadership responsibility among faculty in the dean's office. We needed a leader who understood what it would take to build the school's reputation globally. And we needed a leader who saw the power that could be harnessed by achieving greater Kellogg alumni engagement. With Dipak, Kellogg was fortunate to have the right person in the dean's role at the right time." At the time he took office in July 2001, Jain expressed a sense of humility and respect for the leadership opportunity. "I could never have imagined this," Jain said shortly after assuming the deanship. "It is as if someone handed me a wonderful, thriving plant with the highest level of responsibility to care for it. Now we must strengthen the roots and grow the branches wider." Today, that plant stands even taller, the roots more firm, the branches broad and stretching for the sun.